Now that you’re acquainted with the sublime madness of manky mallards and manky muscovies, perhaps you’re ready to be initiated into the next circle of Domestic Waterfowl Hell: the ganky goose. 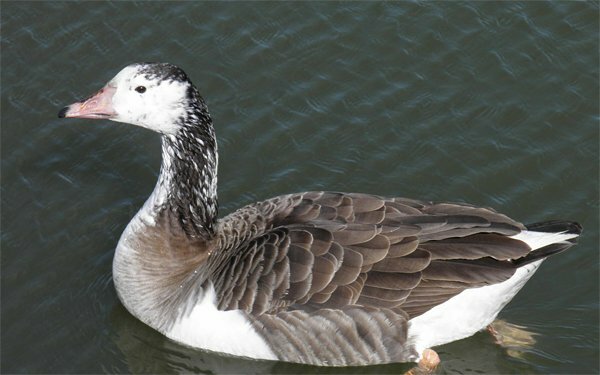 Most of the world’s domestic geese can be traced back thousands of years to the wild Greylag Goose (Anser anser) although domestic geese were also bred from Swan Goose (A. cygnoides) ancestors. Like manky mallards, ganky geese display remarkable variety due to both the methodical manipulations of breeders and the variable volatility of the more natural kind of breeding. Feral geese run the gamut from pure white to almost entirely gray or brown. Even the ones that bear the same plumage as their progenitors, however, can usually be distinguished by their larger bulk. The smaller white breeds like Czechs and Romans may be separated from Snow Geese (Chen caerulescens) by the lack of black feathering and even different-shaped bills. 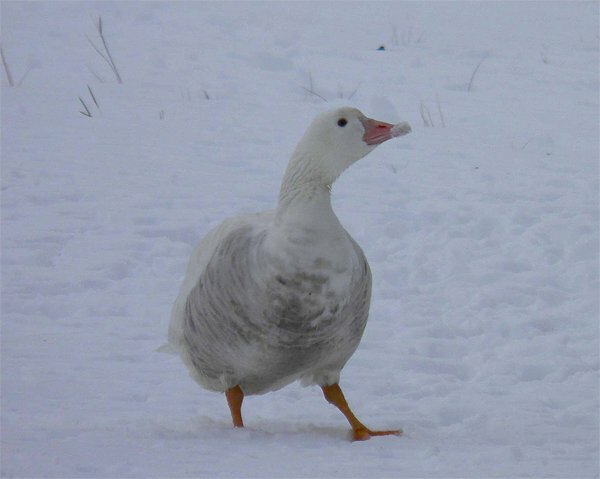 If you have great photos of domestic geese you’d like us to add to this gallery, send them to mike AT 10000birds DOT com! I see goose hybrids regularly since the local, nonmigratory Canada Geese happily interbreed with the domestic geese at a county park’s zoo. I’ll guess Pilgrim and Emden cross for the first one, and Emden, Pilgrim, Toulouse cross for the second. I always think and mankies and gankies prove God has a sense of humor! I SAW THIS GOOSE IN HERSHEY PA, THOUGHT IT WAS A LEUCISTIC CANADA GOOSE. HERE’S THE LINK TO THE PICTURE. SAME SIZE, MOSTLY SAME COLORING PATTERN, EXCEPT FOR THE LACK OF BLACK. I’M IN AN RV PARK IN SOUTHERN CA. WITH MANY SMALL STREAMS WHERE I’M SEEING 50 OR SO GEESE, BOTH CANADIAN AND A VARIETY THAT IS BROWN, TAN & WHITE WITH A BLACK BILL AND AN ODD, LARGE, BLACK “BUMP” PROTRUDING IN FRONT OF THE EYES. PLEASE E-MAIL ME IF YOU KNOW WHERE I CAN FIND OUT MORE ABOUT THIS SPECIES. ALSO, 3 CANADIAN GEESE ARE INJURED FROM FISHING FILAMENT THAT ZGOT TANGLED AND MANGLED THEIR FEET; ONE HOBBLES ON A STUMP AS HER FOOT HAD TO BE AMPUTATED. THE OTHER GEESE SHUN HER & DROVE OFF HER 6 BABIES. SHE SITS, ALONE 24/7. i’VE HEARD THERE ARE PROSTHETIC FEET FOR BIRDS. WHERE COULD I FIND HELP FOR HER? THANK-YOU! Hi Carol… no need to yell! The odd geese you describe are called Chinese Geese, domesticated descendants of the Swan Goose (Anser cygnoides). Nice observation. I don’t know that I’ve encountered these birds in the wild yet. As far as bird prostheses go, I know nothing.